The Roseland Community Festival – a recipient of the 2017 Pop-Up Creativity Grant from Creative Sonoma – is an exciting new music and art festival staged in the heart of the Santa Rosa’s vibrant Roseland neighborhood. 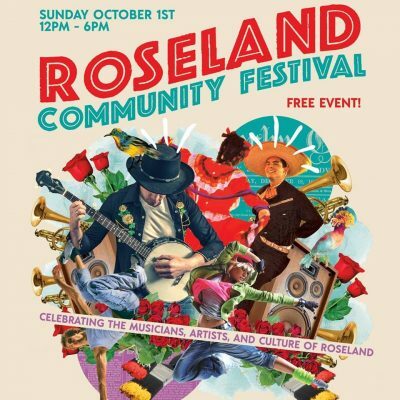 Celebrating the musicians, artists, and culture of Roseland, the first annual Roseland Community Festival is a daylong event of music, art, and food, that kicks off on Sunday, October 1st, from 12pm – 6pm at the Roseland Village Neighborhood Center (555 Sebastopol Road, Santa Rosa, CA 95407). This event is family-friendly, bilingual, and 100% FREE! RCF features an exciting lineup of all-local bands and musicians including Black Sheep Brass Band, Oddjob Ensemble, The Easy Leaves Duo, Banda Pacifica, Nuevos Aventureros, Jasid Guerrero, DJ Rob Cervantes, and more! There will also be a variety of other live entertainment including the Oaxaca In Wine Country dancers, a fashion show by Miss Latina Wine Country, circus stilt-walkers by Symmetry Performing Arts, and live vaudeville by North Bay Cabaret! In addition to all of this, RCF includes an interactive Children’s Activities Area, Educational Demos, Non-Profit Info Booths, a Pop-Up Art Gallery of local visual artists, and an amazing selection of Food Vendors from local neighborhood vendors – most of which are small, family-owned eateries from Sebastopol Road in Roseland. We see this event as a great way to celebrate and support local musicians, artists, small businesses, and non-profit/community organizations – especially in the vibrant, Roseland community, and in order to make this event possible for FREE, we are reliant upon the valuable work of skilled volunteers like YOU to make it possible! If you share our vision of providing greater access to music and art, celebrating and supporting the vibrant and diverse Roseland neighborhood, and offering FREE events for the masses, then then volunteering for RCF might be a good fit for you! We are putting this event together at a rapid pace and are solely reliant on sponsorships/donations to cover the production costs, and volunteer labor to make all the magic happen! Disfruta un domingo familiar con toda la familia este próximo 1ro de Octubre. Habrá música en vivo, comida, entretenimiento para niños y mucho mas!Evento completamente GRATIS!